"An exciting, thought-provoking conclusion to the Bothynus Trilogy; Reed skillfully highlights the tensions between good and evil and the mysteries shrouding these extremes in ways that are likely to force the reader to contemplate his or her own mysterious existence and relationships. A captivating novel that satisfyingly concludes the thrilling Bothynus series. Don’t miss it!" The Columbia Review. “Triangulate” by D.K. 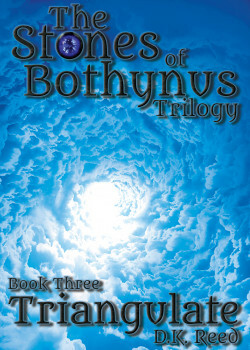 Reed is the third and final installment in the “Stones of Bothynus” Trilogy. This young adult series follows the adventures of the Greene family and combines supernatural romance with the intrigue of mystical realism. In Books One and Two, author D.K. Reed highlighted the interesting experiences and provocative mysteries that the Greene family members experienced as a result of their missing Uncle Alistair’s research on three ancient stone artifacts. Though the stones’ secret powers continue to allude the human characters in Book Three, the ancient demons seem to understand their mechanisms and are determined to possess the stones for their own purposes. The third stone plays a central role in the final book of the series and is perhaps the most mysterious stone of the bunch. “Triangulate” continues where Book Two left off with Annie (the intensely curious fifteen-year-old who discovers an angelic being and ancient writings in a hidden cave on her grandmother’s farm) and Aaan (the angelic being discovered by Annie who is pleasantly moved by this unexpected and enjoyable interaction). In Book Three, Annie realizes that she is in love with Aaan and decides that she must see him again. The clock races, however, as she only has 2 weeks at her grandmother’s farm before she must fly to Budapest to visit her childhood best friend. Fortunately, one day Aaan presents himself to Annie as a playful satyr manifestation and agrees to accompany her on her travels overseas. However, the situation changes and Annie is troubled when Aaan agrees to allow Erik to use him for research on the stones: “She was a little shocked and dismayed at Aaan’s excitement in allowing Erik to experiment on him. Since he and Alistair had learned from Aaan that the Angel Stone was only supposed to work on angels, they were anxious to see what it would do on him. Erik admitted it would be unlikely to help with fixing world problems, like food storage, but it was a good opportunity to learn about the stone’s potential. And who knew its potential without experimentation?” Aaan’s half-angel existence may effectively unravel the Angel Stone mystery and open up doors to ancient knowledge. Has Aaan opened himself to danger? Is Annie ready for what’s to come? The intensity that had been building up throughout the first two books in this series culminates in epic and poignant challenges in Book Three. “Triangulate” ultimately finds Annie possessed by a demon, leading to rigorous psychological and spiritual battles that grow in strength and require family and friends to join in. “Triangulate” presents an exciting, thought-provoking conclusion to the Bothynus Trilogy. The characters’ seemingly fantastical adventures and challenges are surprisingly not too dissimilar from those that we often face in our own daily lives as humans. D.K. Reed skillfully highlights the tensions between good and evil and the mysteries shrouding these extremes in ways that are likely to force the reader to contemplate his or her own mysterious existence and relationships. A captivating novel that satisfyingly concludes the thrilling Bothynus series. Don’t miss it!